Football truly is a game of opinions. In the aftermath of the Albion’s effective 2-0 ‘mugging’ by Leicester City, with Glenn Murray missing a penalty with the score goalless, some bright spark decided to put up a poll on social media with the question: Do you love or hate Glenn Murray? If initially putting the poll on astounded me, when two per cent of the pollsters said they hated Murray, that beggared belief. Then again, these social media polls can get hijacked by trolls from other clubs, so let’s just say the 98 per cent voted with both their hearts and perhaps more importantly their football brains. We all have our own opinions when it comes to the Albion and that all important all-time XI. What I will say having watched the Albion for 45 years this month, in all four domestic divisions, my XI has evolved over the years. Mark Lawrenson is one name in the XI who will never be removed. He is quite simply the greatest player to have played for the club in the time I’ve watched them and arguably the greatest of all time. When it comes to the forward positions, for many years, despite the credentials of the likes of Zamora, Ward and Byrne, I’d always plumped for the early 80s duo of Michael Robinson and Andy Ritchie. Not only because as a fresh-faced teenager in the early 1980s they mesmerised me at the Goldstone but also because of the hard facts that in the season the Albion finished their highest ever position to date in the top division, 13th in 1981-82, they were predominantly the front two. However the time has now arrived where I not only switch from 4-4-2 to 4-5-1, but Ritchie and Robinson now find themselves on the bench, with Murray leading the line. To date, this is the highest level of football the Albion have ever played in. Clearly it was never going to be a cakewalk, and in particular Murray has missed more than one crucial spot-kick, but his scoring record at the Albion, in three of the four domestic divisions, says it all. For me, as a striker playing at the highest domestic level, he ticks all the boxes so therefore is consistently the best striker to play for the club. That fact alone gets him into my all-time Albion side. I hope he gets the opportunity this weekend to make amends for his Easter Saturday penalty miss, when the Albion take on Huddersfield Town. It’s possibly the most pivotal fixture in the club’s history since the Hereford United game in 1997. 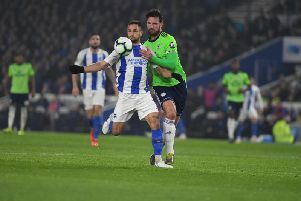 Quite simply, with what’s going on in and around the relegation zone, a win for the Albion on Saturday will effectively guarantee Premier League football and the £100million-plus revenue that comes with it. I’m confident they can do it, a 2-0 win for the Albion. If the Aussie ball tampering revelations weren’t bad enough, by the end of last week we were treated to David Warner’s melodramatic press conference. Will the bans end their careers? Somehow I doubt it, and I’m pretty sure that Steve Smith’s redemption will eventually see him return to the Test arena, while Cameron Bancroft is young enough to come back. Warner is a different matter. I think his Test career ship has well and truly sailed but his 20/20 talents, and my belief that the cricketing money men around the globe have no scruples, means he will return to make a lot of money in the white ball game. I will also be interested to see which English county bites the bullet to sign him for the T20 Blast?